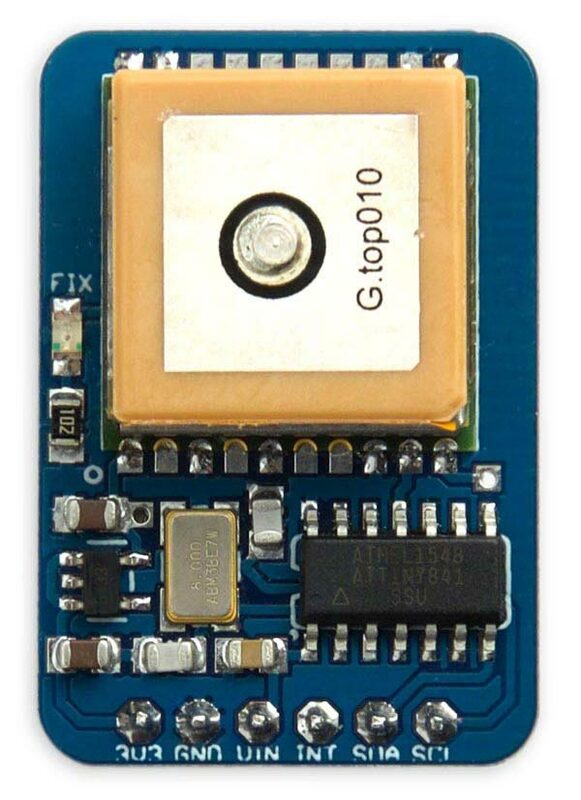 The I2C GPS Module based on an ATtiny841 and a GTPA010 GPS module. As an example of using the module I also describe a GPS mapping application, that plots a map of your route on an OLED display. I based the PCB on the GlobalTop Technology FGPMMOPA6C GPS module, also known as the GTPA010 , and these are available from Aliexpress . It should also work with more recent versions of that module, such as the PA6H available from Adafruit . The GPS module is rated at 3.3V so I included a 3.3V regulator on the board so you can power the board from 3.3V or 5V. The NMEA sentences are decoded by an ATtiny841, and this also runs the I2C slave routine. To read the GPS data you write one byte to specify the offset of the first variable you want to read, and then read the appropriate number of bytes corresponding to the values you want to read. For example, to read just the latitude and longitude you'd write 4 and then read 8 bytes. SDA and SCL are the I2C connections. INT is an optional interrupt output that goes low when data is ready to be read, and is cleared by reading data via I2C. Power should be supplied to VIN, which can take between 5V and 3.3V, and GND. The 3.3V pin is an optional output, provided in case you want to power other 3.3V devices. If you are connecting this to a microcontroller with 5V signals, like an Arduino Uno, provide 5V to VIN, so the SCL and SDA signals are at a 5V level. However, if your microcontroller has 3.3V signals, like an Arduino Zero, provide 3.3V to VIN so the SCL and SDA signals are at a 3.3V level. Depending on what you're connecting the I2C GPS module to you may need pullup resistors of about 4.7kΩ between the SDA and SCL lines and Vcc. I found I didn't need them connecting the module to an Arduino Uno, but did need them with an Aduino Zero. The ATtiny841 is in an SOIC package, and the resistors, capacitor, and LED are all 0805 size, so they should be relatively easy to solder by hand. The crystal is 5x3mm, and the regulator is in an SOT32-5 package. I recommend only soldering the tabs of the GPS module that are connected, to make it easier to remove the module at a later date if you need to. For details of the code see my earlier article I2C GPS Module. I compiled the program using Spence Konde's ATTiny Core . Choose the ATtiny441/841 (No bootloader) option under the ATtinyCore heading on the Board menu. Then choose ATtiny841, 8 MHz (external), B.O.D. Disabled from the subsequent menus. I connected to the ATtiny841 using a Pomona test clip that fitted to the top of the chip , using the Sparkfun Tiny AVR Programmer . Choose Burn Bootloader to set the fuses appropriately, then choose Upload to upload the program. Alternatively, get it on GitHub here together with the Eagle files for the PCB: I2C GPS Module on GitHub. Or order yourself a board from OSH Park here: I2C GPS Module. Here's an example to demonstrate a simple application of the I2C GPS Module. It plots the GPS position to a monochrome 128x64 OLED display, so as you walk around it shows a track of your route. I initially wrote and tested the example program in uLisp, my Lisp interpreter for microcontrollers; for details of the Lisp version see GPS Mapping Application on uLisp. I then converted this to the C program described below. A walk around the block plotted using the GPS Mapping application. The C version should compile and run on any Arduino board, down to an Arduino Uno. Circuit of the GPS Mapping application. Of, course, if you don't want to make a PCB you can use this application with the breadboard version, I2C GPS Module. The display needs to be a monochrome 128x64 OLED display based on the SH1106 driver chip; for example, the Geekcreit 1.3" I2C OLED display, available from Banggood . The SH1106 driver chip supports reading back the display memory, which is essential for plotting a single point without affecting the neighbouring points. The main part of the program reads the latitude and longitude from the I2C GPS module, converts them to x,y coordinates, and plots them as a point on the display. where φ is the latitude in radians, λ is the longitude in radians, and R is the earth's mean radius, 6371km. With these figures each pixel represents 10m, so the whole display represents an area 1280 x 640m. Here's the whole I2C GPS mapping application: I2C GPS Mapping Application. If you go beyond the area represented by the display the plotting will give unpredictable results, so it would be better to test that the x and y values are within range. With a bit more work this program could form the basis for a GPS treasure-hunt project, or a hiking companion. ^ PA6C (MTK3339) GPS module datasheet on Adafruit. ^ GTPA010 MT3339 PA6C GPS Standalone Module on Aliexpress. ^ Ultimate GPS module - 66 channel w/10 Hz updates - MTK3339 chipset on Adafruit. ^ Adafruit ItsyBitsy M4 Express featuring ATSAMD51 on Adafruit.